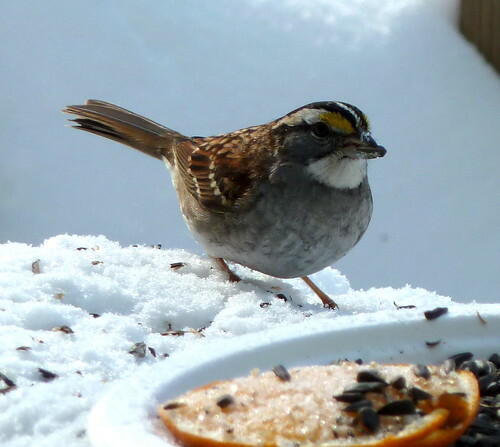 white throated sparrow with sunflower seed, originally uploaded by jahansell. I promise I won't turn this into a bird blog - but this fellow was so handsome with his yellow lores and spiffy white throat. I sat on my porch to try to get shots not through a window - it took a long time for them to be brave enough to come eat with me sitting right there. But come they did, at last - a bird's gotta eat, especially when it's zero degrees. He is very handsome, not unlike our sparrows here in the UK. Ours however have no yellow on them. He is a fine looking fellow, isn't he! I have picked up the habit of anthropomorphizing the birds at the feeder - so rather than a male cardinal or a female cardinal, we get visited by Mr. and Mrs. C. Silly, but it makes them seem even more friendly!